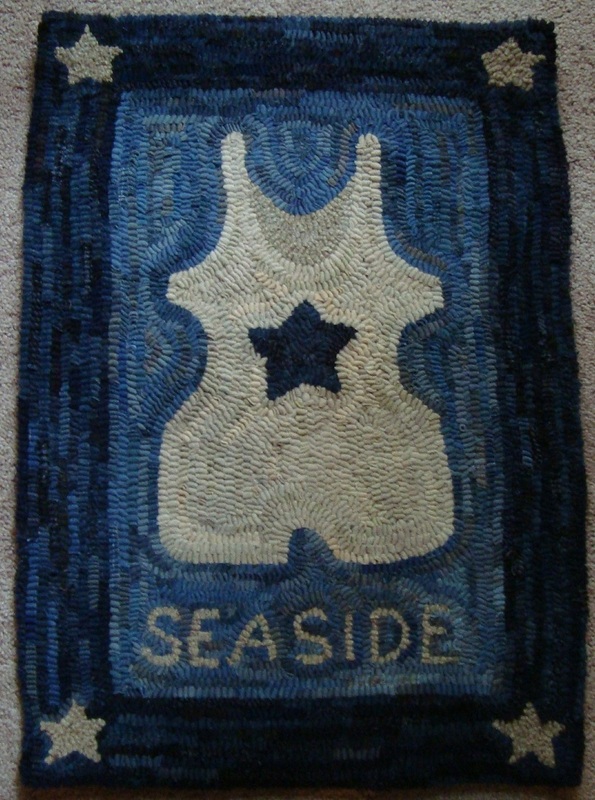 This Seaside Swimsuit rug would be a great piece for a beach house and has been made so that it can hang on the wall or remove the dowel and place on a chest or table. The binding on the back is blue and white pillow ticking so the back looks as pretty as the front (almost). It has been hooked using #8 and #8.5 wool strips of fabric on natural linen foundation. 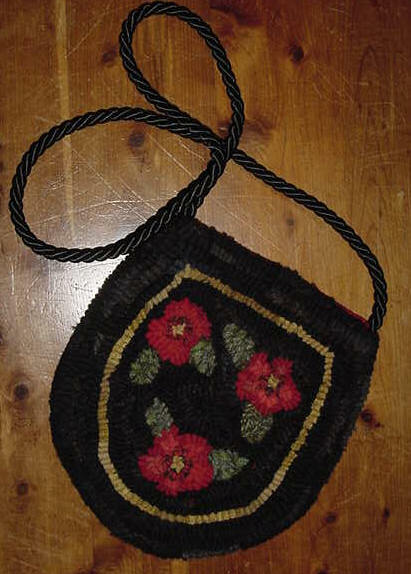 Adapted from a Polly Minick design, it measures 17 1/2" x 24 1/2". This beautiful piece could be yours for $250 plus shipping. Look at the companion piece next to it. This picture was taken without a flash so it shows a little darker than it really is in person. SOLD and residing in MA. 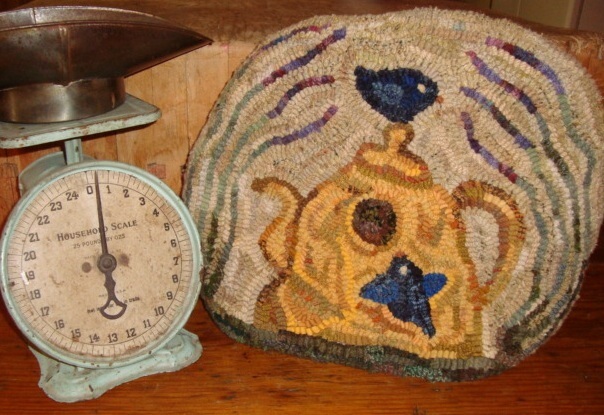 Another great beach house wall decoration, rug for the floor or draped over a chest. It would make a great companion piece to the rug on the left. 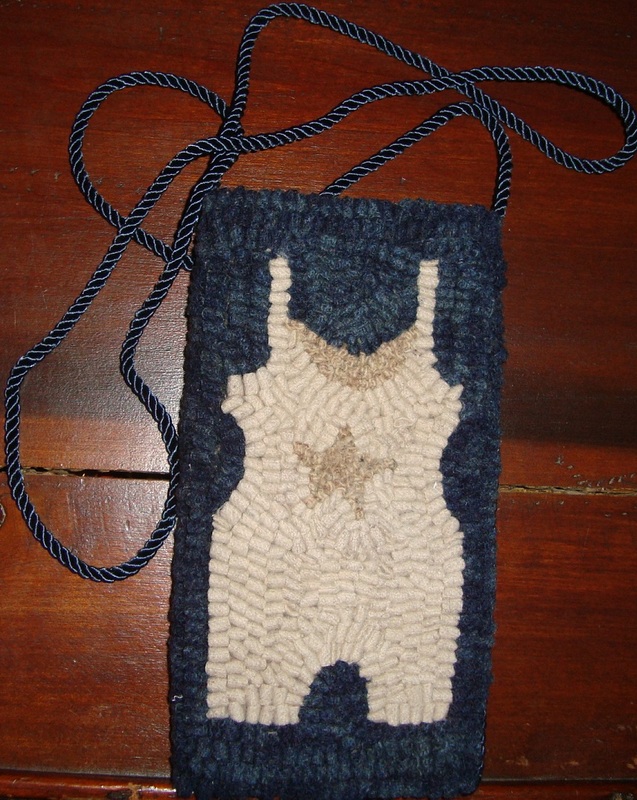 This picture was taken with a flash but the same light wools were used in this design as was used on the swimsuit piece. This was hooked using both #8 and #8.5 wool strips and hooked on natural primitive linen foundation. As with the other rug, it is bound using blue and white pillow ticking and has been made to hang on the wall by using a dowel in a sleeve or without the dowel for other uses. Adapted from a Polly Minick design, this measures 13" x 27" and could be yours for $205 plus shipping. Ooh la la... vintage swimsuit. If you live at the beach or a beach junkie, this would be the perfect eyeglass case, cell phone carrier, place for credit cards, car keys and cash. Light weight and classic. It measures 4 1/2" x 8" hooked front and back with a satin cord strap measuring 48" long. It is lined with a soft blue and tan flannelette fabric to protect glasses. This can definitely hang across the shoulder or, since it is a light weight cord you could knot it and wear around the neck. If you go to conventions you could use this to put your room key in, eye glasses, cash, etc. $50 plus shipping. Another new hooked purse is a Kindred Spirit inspired piece. It is hooked with both hand dyed wool and as is wool in #8 cut wool strips. The purse is lined with rayon red complimentary fabric with a small pocket inside to accommodate lipstick, car keys or small cell phone. There is a cloth covered snap closure. The back is solid wool not hooked, and measures 9" x 9 1/2". Yours for $68 plus shipping. 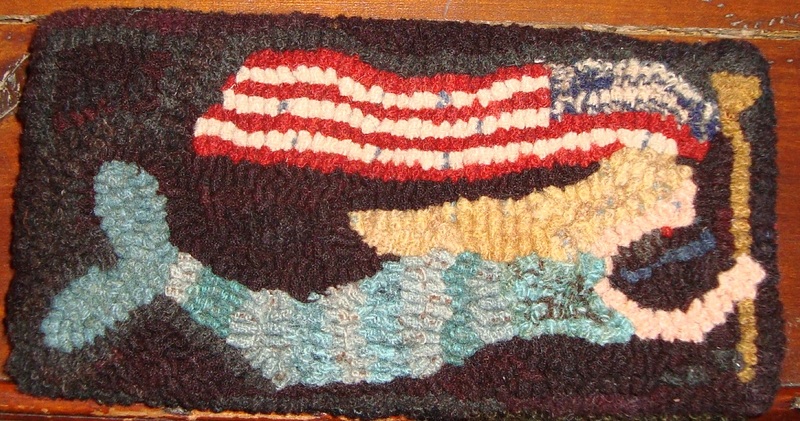 This is a patriotic Mermaid Eye Glass case which measures 4 1/2 " x 8 1/2" and has been hooked front and back. This has a red plaid flannelette lining to protect glasses. This comes without a strap so is more adaptable to an eye glass case or a cell phone carrier. Definitely a classy beach goers eye glass case for self or gift. $45 Plus shipping. This has been sold but will be making another real soon. if you are interested, please contact me. 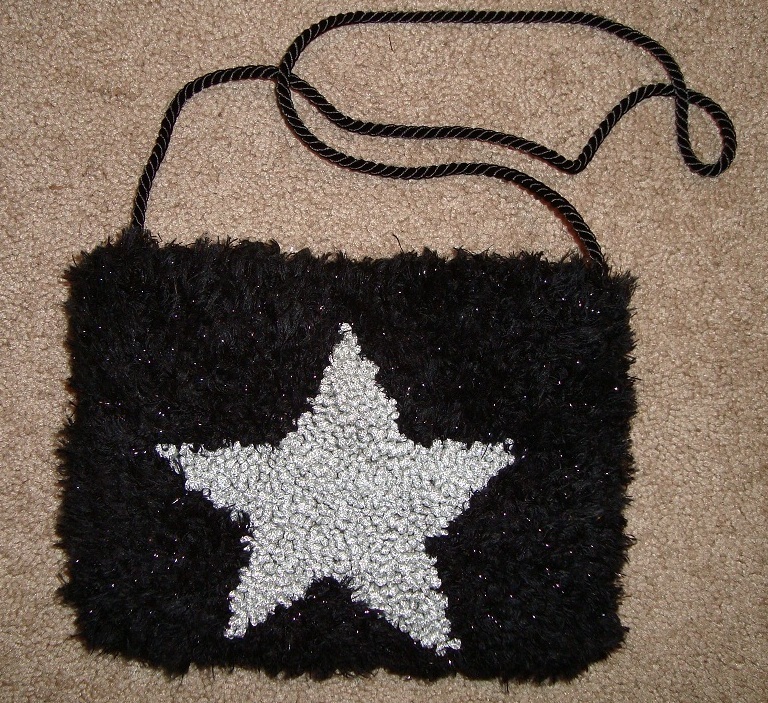 This purse is inspired by a design of Lori Brechlin of Notforgotten Farm. This is hooked in #8 and #8.5 wool strips some of which was hand dyed by me and some as is wool. The purse is fully lined with a black rayon fabric which has a small pocket inside to accommodate lipstick, car keys or small cell phone. There is a cloth covered snap closure. The back is solid wool not hooked on the back and measures 9" x 9 1/2". This is an adaptation of an antique rug. 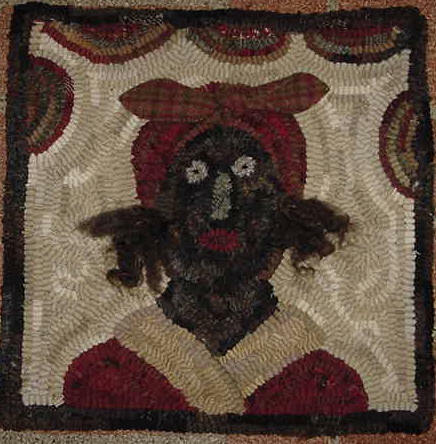 Our foremothers used whatever colors and whatever textiles they had available to hook their rugs. 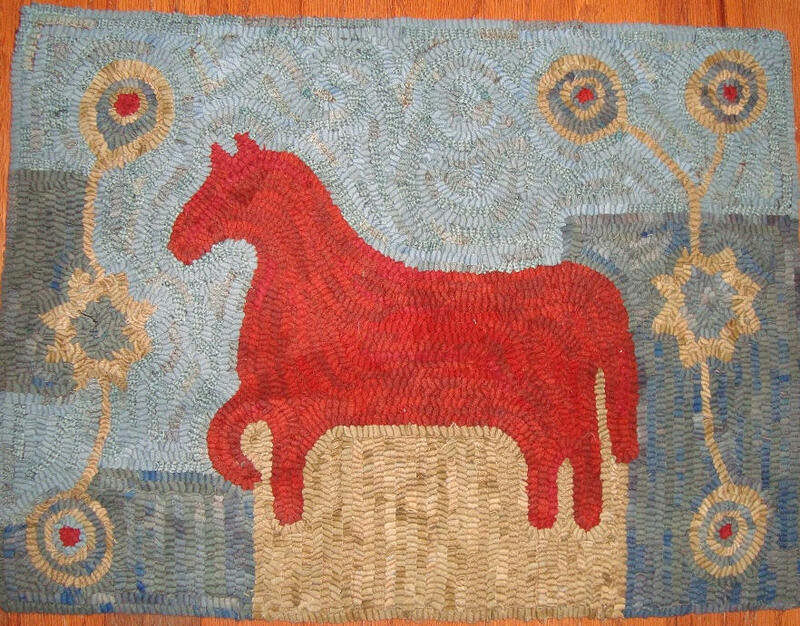 The wools used in this rug were hand dyed by me to achieve complimentary and olden colors. I love the red horse and how the background makes it pop out at you. This pieces measures 19" X 26" and is a perfect size for a table top, floor rug or could be hung on the wall. $275 plus shipping. Another style Light House on rocks keeping a mindful eye on seafaring safety. This one is hooked front and back and measures 6 1/2" x 9". It has a snap closure with a light blue with stars cotton lining. 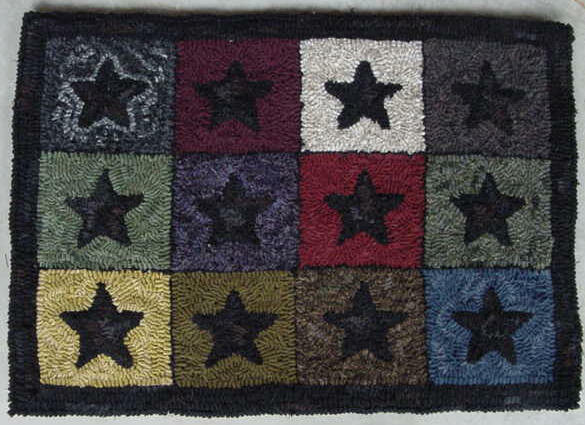 The strap lengths measures 41 1/2"
Hit and Miss Folk Art Stars rug measures 17" x 24". 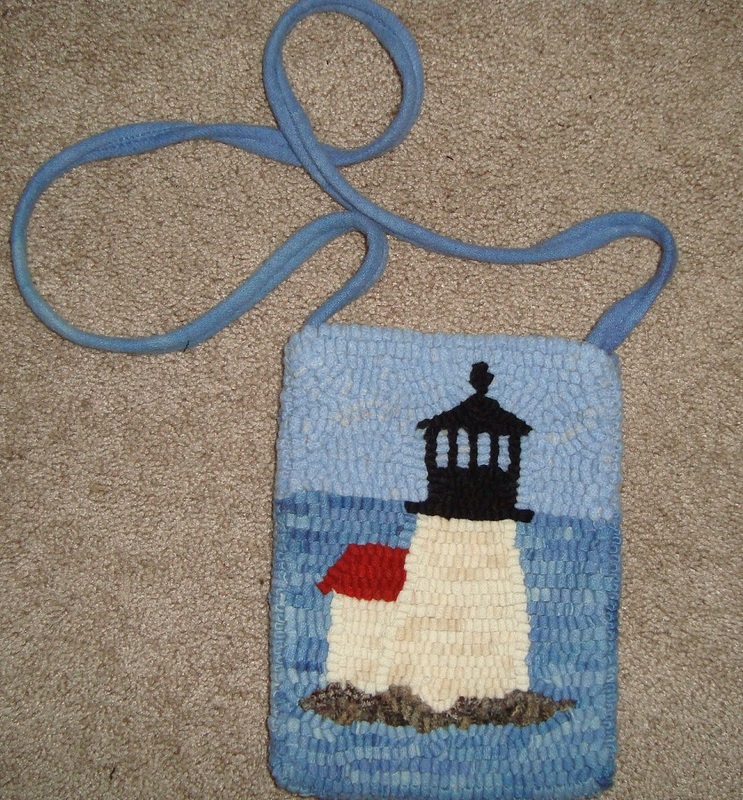 It is hand hooked on Scottish Burlap using 1/4" wool strips. The burlap foundation has serged edges which are turned under and covered with a wide cotton binding tape hand stitched. The wool used is a combination of as is and hand dyed wool. Great for the wall, table top, on top of a chest or on the floor ~ Yours for $225 + shipping. Isn't this an adorable tea cozy? Actually it could be used to cover a two-slice toaster, tea pot or hide those meds you keep out in the kitchen so they aren't an eye sore. Heck, you could also hang it or use it on the table as a hot plate because it does lay flat. The inside is lined with a gold colored cotton fabric which has been sewn to a stabilizer to help it stand. The back is a flattering neutral textured wool. This is a design by Primitive Spirit and hooked by me in both #8 and #8.5 wool strips on primitive linen. Can be yours for $125 plus shipping. 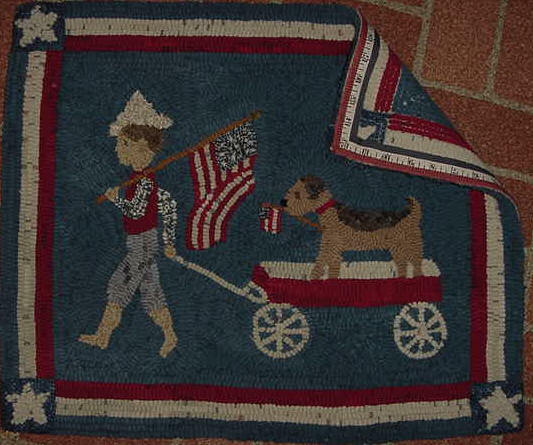 The Boy pulling a Wagon is hooked in patriotic colors and is a design by Polly Minick. It measures 20" x 24" and hooked with a combination of hand dyed and as is wool strips. The seam tape is a very nice ribbon binding tape also in patriotic colors. Yours for $265 plus shipping. 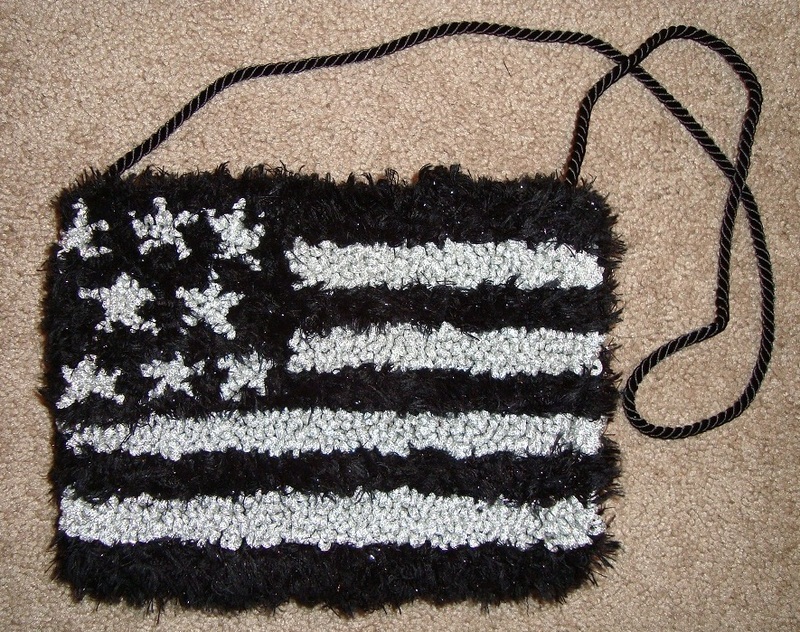 Two-in-One elegant Stars and Stripes Evening Bag has been hand hooked using silver sparkle yarn and black shiny eyelash yarn and measures 7" x 9". One side has a large hooked star and the other has the stars and stripes. The inside has a textured rayon lining and has a rayon twisted cord strap. There is a snap closure. Yours for $60 plus shipping. 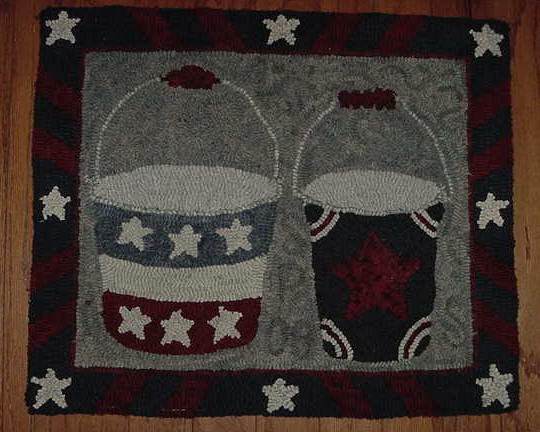 Patriotic Sand Pails was hooked by me using 1/4" wide wool strips and is a design by Polly Minick. It measures 23 1/2" x 20". The border is a combination of the stars and chevrons in deep red and navy blue. This would make a great wall hanging, floor rug or to display on a chest or table top. A great piece for a beach house all year round or use during patriotic themed months if you are the type to rotate your accent pieces. Would also make an excellent gift to someone in the military. Yours for $265 plus shipping. 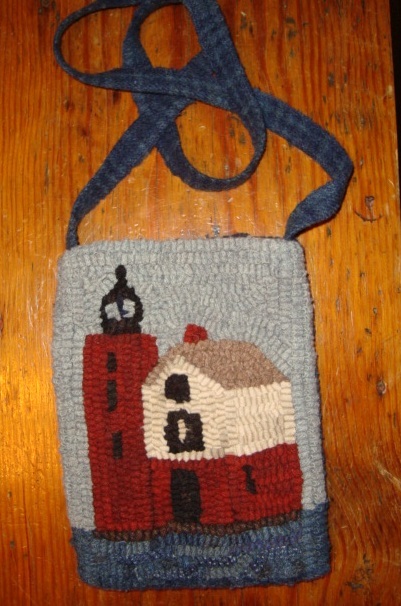 A lighthouse bag would make a perfect statement while vacationing at the beach and it is light weight and big enough to carry credit cards, cash, cell phone and car keys. 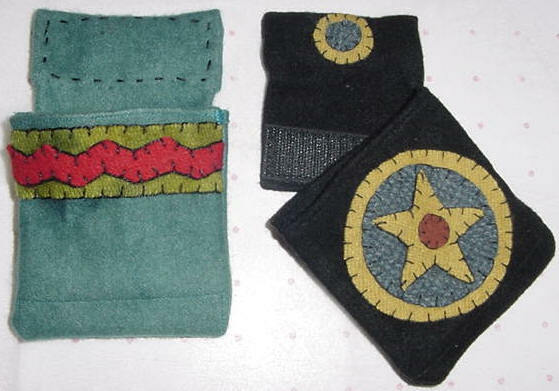 It measures 7" x 9" and is hand hooked using 100% woven wool on the front and the back. The back is hooked using the same blue as in the water and the strap. It is lined with stripe pillow ticking and has a snap closure. Yours for $55 + shipping. This is my design and based on a woman I knew from the age of 3 years old. She was a wee bit of a woman who helped care for my ailing grandmother. Auntie Peanut loved our family as much as we loved her and she used to say that my hair was so curly that I looked just like Shirley Temple. The mat measures 12 1/2" x 12 1/2" and is hooked using #8 wool strips. Her kerchief bow is a piece of wool which I stitched into place to look three-dimensional and her hair is natural wool roving to give that dimensional look again. A sleeve has been sewn in the back so it is ready to use as a wall hanging. $85 plus shipping. The Jack-in-the-Box is ready to be used as a wall hanging or could be displayed on a dresser of a child's room. This would make a wonderful gift for an expectant parent or even your own child's room. It measures 12" x 18 1/2", has been hooked using both hand dyed wool and as is textured wool. 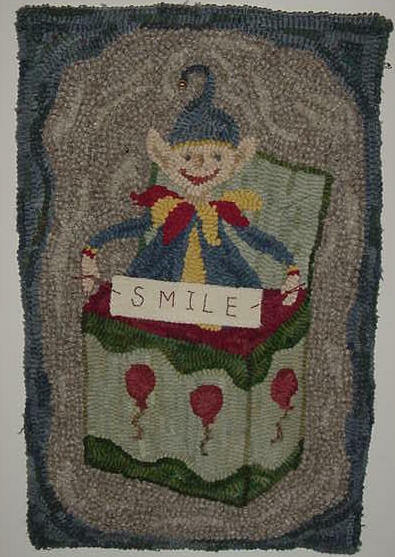 At the tip of the cap there is a gold bell and in it's hands is a woolen piece of wool with the word 'Smile' stitched using embroidery floss. I could customize the piece by embroidering the child's name and replace the one that is presently shown. Or, if you want no sign you can easily remove the 'Smile' wording with just a couple snips of thread holding it in place . Yours for $105 plus shipping. 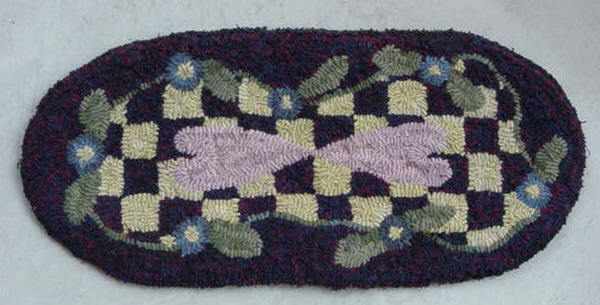 This is an adaptation of an antique rug which was originally hooked in 1880. I have hooked that date into the bottom right hand side of the rug. I have used 1/4" wide wool strips and have hooked it in keeping with the original. 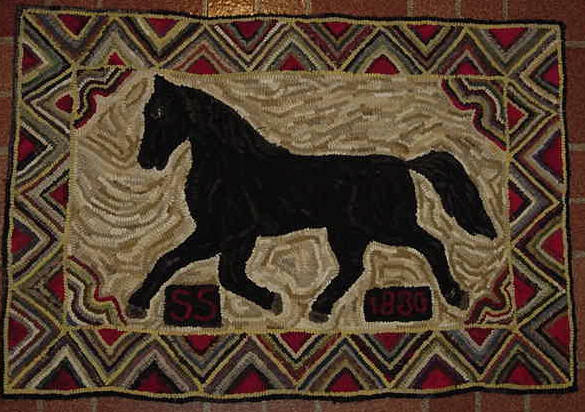 The rug measures 24" x 36", is hooked on angus burlap foundation, has serged edges which are turned under and covered with cotton binding tape. $485 plus shipping. 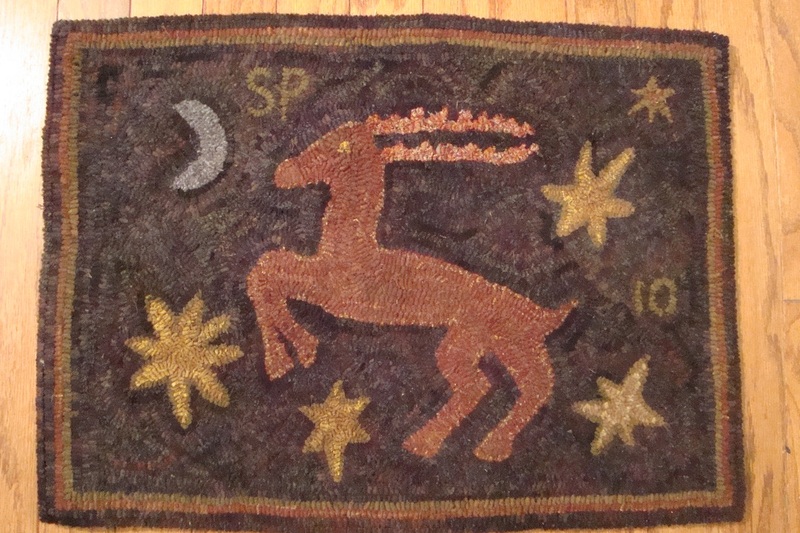 This Stag Rug is an antique adaptation of a rug originally hooked in the 1800's. It measures 20 1/2" x 28" and is hooked using #8 and #8.5 wool strips of as is textures and hand dyed wool. It is hooked on natural linen backing. This would look marvelous over a fireplace mantle at the hearth of a fireplace, on an antique chest or harvest table. $340 plus shipping. The checkerboard oval table runner is 10" x 22 1/2". It is hand hooked using a combination of hand dyed wool and 'as is' wool. The border and dark checker squares are a very dark blue and burgundy plaid which hooks up really nicely and makes a mottled look. The remainder of the wool used is all hand dyed by me. This is a Kindred Spirits design that would look great in any decor ~ antiques, shabby chic, cottage, or traditional. It is $125 + shipping. 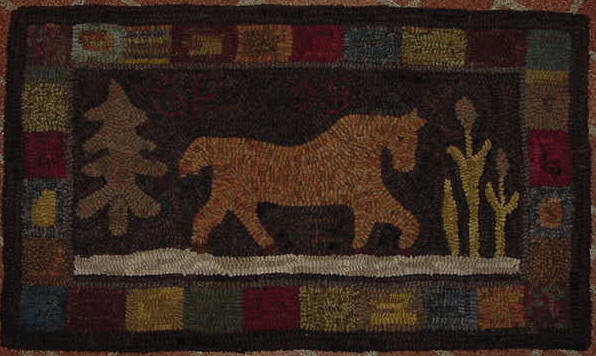 Debbie's Horse measures 17" x 29 1/4" and is a design by Woolley Fox. I hooked the rug using #8 and #8.5 wool strips. The earthy colors gives it an old look and the lighter color at the bottom grounds the piece. It would look lovely above a fireplace, on a harvest table, at a cabin or a gift for that horse lover you know. Everyone tries to make a better mouse trap and I think I've made one. The first picture to the right shows how the pouch portion is attached with Velcro. This way if you use the keeper to hold your snippets, it can be removed from the magnet without removing the magnets and scissors from the frame. 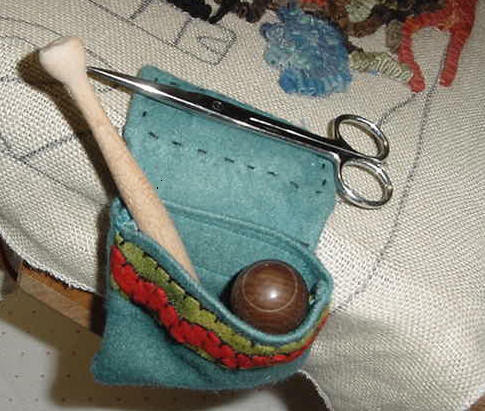 The second picture shows how I use my Snip-n-Tuck Keeper; I put my scissors on the top magnet and my hooks in the pouch. There is a heavy piece of canvas sewn into the bottom to prevent the hooks from penetrating the wool. The Snip-n-Tuck Keeper is $25 plus shipping. I am always creating more styles, colors and shapes, please e-mail me if you wish to see a picture of the ones I have in stock now or would like a special order. I recently had a guy request a more manly one with no appliqué at all, and in a grey herringbone. 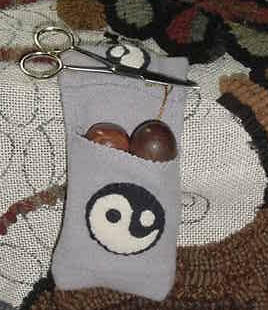 This Ying and Yang design is another version of the Snip-n-Tuck which is not removable with Velcro. Again there is a piece of canvas sewn in the bottom so that the hooks cannot penetrate thru. If you would like pictures of other designs in stock, please write me.